Today I am quite giddy to introduce two people who I find fabulous, Adam Jay Epstein and Andrew Jacobson! These two amazing men are the authors behind the upcoming book, The Familiars and as I'm sure you know it is a book that I cannot wait to read! Please give them a warm welcome, and let's get started! 1) What inspired you to choose animals as your characters instead of people? The whole idea of writing about the familiars was born out of the fact that we were interested in telling a traditional fantasy story from a perspective that we had never seen before. Familiars in popular lore had always been sidelined to being assistants and helpers (ie Hedwig in "Harry Potter" or Shadowfax in "Lord of the Rings"). We wanted to see what would happen if they were forced to be the heroes! 2) Do you feel that it was easier or harder to write animal characters? We think there are a few extra challenges to writing animal characters, in that they lack opposable thumbs. But beyond the physical limitations, we knew they had to be as rich emotionally as any human being. 3) What was one item (food or otherwise) that really helped you through the writing process? We're not sure if this is an item per se, but a writing partner. Having another person to bounce ideas off of is better than staring at the blank screen alone everyday. 4) Do you have a favorite character? Everyday, Adam has a different favorite character, he loves them all so much. Today, it's Grimslade, the bounty hunter who is a merciless and wonderful foil for Aldwyn. I'm always curious what new black magic he's going to pull out of his bag of tricks. Andrew would go with Gilbert, who always makes him laugh. Adam would go with Hawaii, but he'll settle with one of our two home offices. He's happy just as long as they're not writing at Peet's Coffee Shop, which makes his clothes reek so strongly of Brazilian Roast that he has to strip down when he gets home so not to make his 3 year old daughter cry. Andrew also finds writing with the sound of any ocean nearby to be heaven, but he, too, can live with working at home. 6) What book(s) have influenced you most? Adam: I have to say the dictionary. I love looking up new words. They fuel my love of writing. 7) What book(s) are you reading right now? Andrew: Just finished The Hunger Games and Catching Fire. I have pre-ordered Mockingjay and can't wait! Yes! The Familiars: Secrets of the Crown (book two of the trilogy) will be coming to bookstores in September of 2011. Thank you Adam and Andrew so much for stopping by my blog! 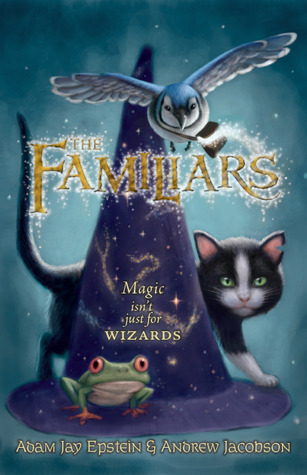 I wish you all the best and I simply cannot wait to get my hands on a copy of The Familiars!